Do you think you are a strong writer? Can you identify the parts of a sentence? 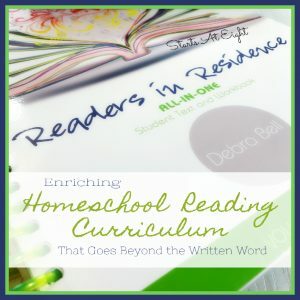 Are you worried about teaching writing in your homeschool? 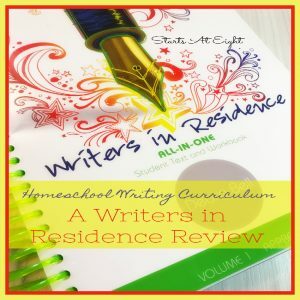 I can tell you that I consider myself to be a strong writer, but I cannot identify all part of a sentence as readily as I should be able to, and while I wasn’t worried in the beginning about teaching homeschool writing, I did go through a period of worry. For that reason I have spent a considerable amount of time researching and using various homeschool writing curriculum options. Apologia seems to be on our radar this year! Both my middle and high school aged homeschoolers have benefited from some of their new curriculum options. If you saw my recent reviews of Readers in Residence™ and Writers in Residence™ Volume 1, you know that these two curriculum options “had my daughter at hello.” She loved the covers and the vibrant colors! While this alone doesn’t make it a fabulous curriculum, it did get her in the door! For my high school age son I was super impressed with the depth and breath of the High School American Literature Curriculum. It satisfies both a composition and an American literature credit. Therefore, the student earns two high school credits! If all of that wasn’t enough then check this out! 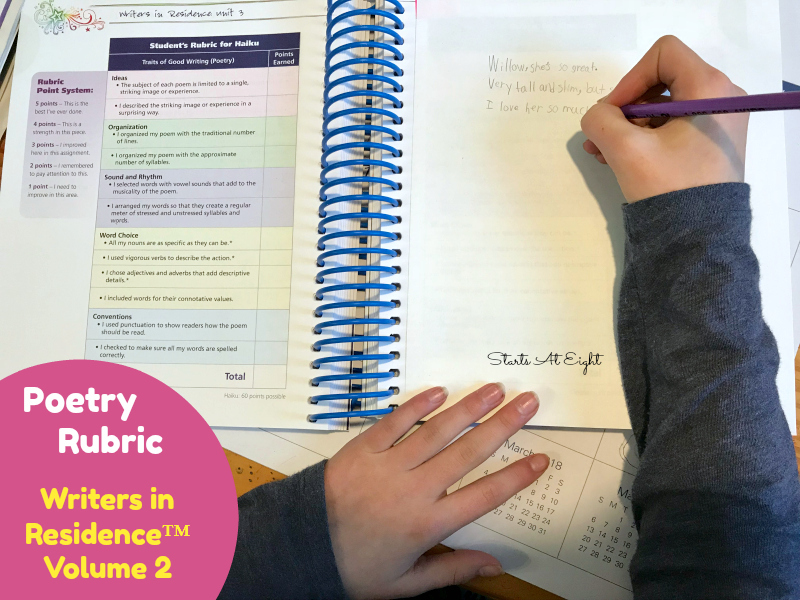 Writers in Residence™ Volume 2 All -In-One Student Text and Workbook and Answer Key is now out! 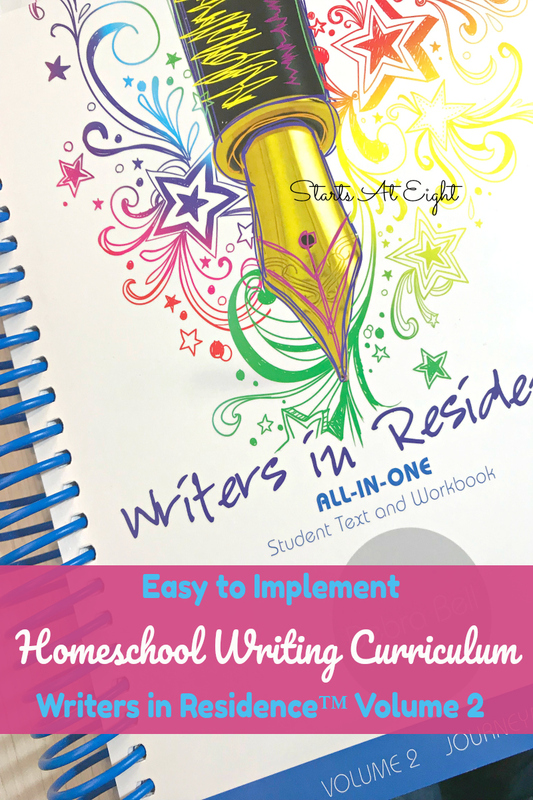 Writers in Residence™ homeschool writing curriculum is designed for kids in grades 4-8. While your child completes various writing assignments – learning about the writing process in steps, with great detail, they will also grow their vocabulary, learn about sentence structure, parts of speech, and the conventions of the English language for punctuation, capitalization, and usage. Writers in Residence™ Volume 2 All -In-One Student Text and Workbook and Answer Key is broken down into 4 Units with 4 different modules in each Unit. They each include final checklists and unit reviews. Each unit focuses on a different style of writing and uses real life writing examples to help teach the concepts required for that style of writing. Unit 4: A Fantastical Tale of Extraordinary Exploits – where your student will learn how to create stories by using their imagination to invent characters, adventures, and unseen worlds. One of the things I want to highlight is the 4 Day a Week Schedule that these courses come with. 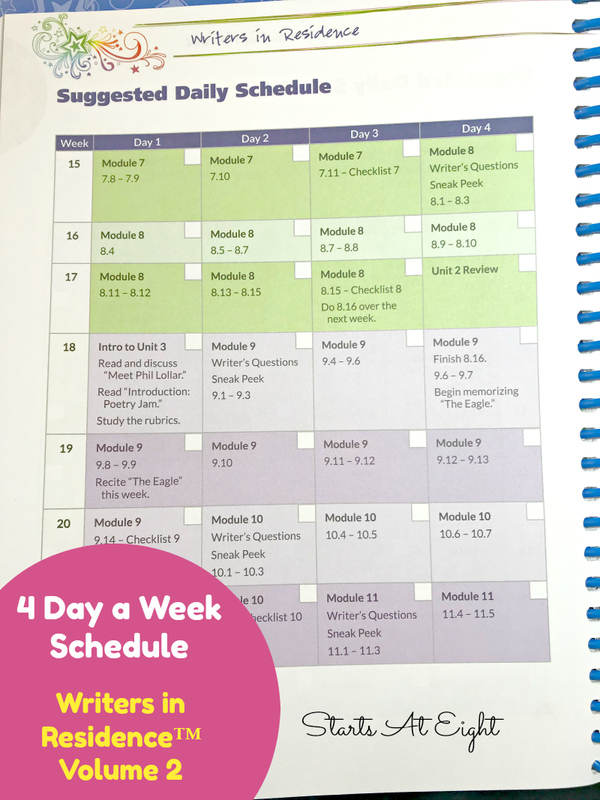 What if you aren’t using a 4 Day Homeschool Week? Some of you might be thinking, “be we don’t use a 4 day homeschool week”! That’s no problem, we didn’t either this year. You could choose to schedule this scenario in two different ways. First you could just choose the 4 days each week you wish to do this. We did every day but Thursday because that is a busy at the barn day for our daughter so it lightened her load for that day. Or the second option I see is to not worry about the “weeks” and just move along to the next assigned lesson every day that you do it. The check boxes make it easy to keep track of where you are! 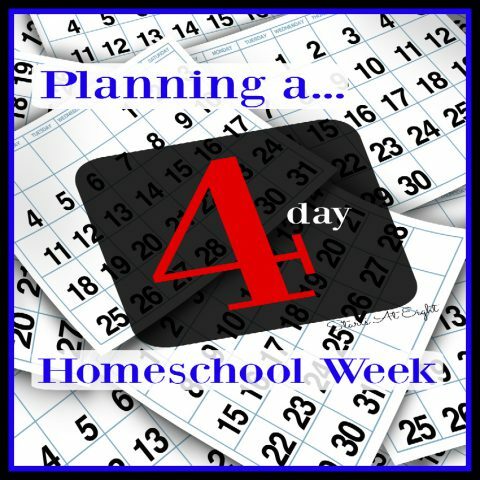 How about if you are using a 4 Day Homeschool Week? Next school year we are switching to a 4 Day Homeschool Week. This can be a good way to build in rest time, build in time for struggling learners, allow for pop up field trips, and so much more! 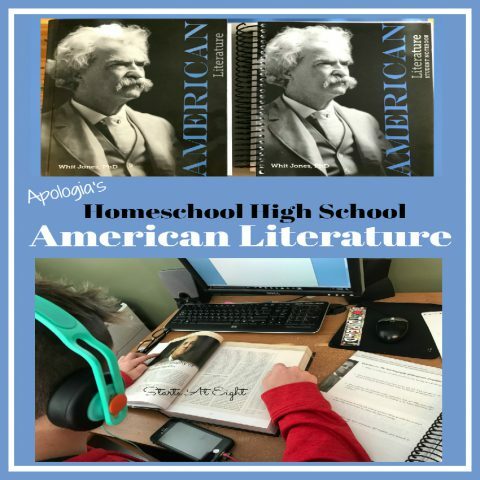 Courses like the Apologia Writers in Residence™ homeschool writing curriculum make it easy for us to do that! I was impressed that each of the units in Writers in Residence™ Volume 2 all focused on a different style of writing than the units in Writers in Residence™ Volume 1. It was refreshing to see more styles and facets of writing instead of a direct repeat of what was done in Volume 1. The poetry unit – POETRY JAM – didn’t consist of just one type of poem. It was an in-depth look at various poetry styles including acrostic, lyric, haiku and cinquain. Beyond these styles there’s work with writing and revising your own poetry for sound, rhythm, and meaning. As with each style of writing, there were multiple real life examples of each type of poetry. You can see a couple of haiku examples in the image below. 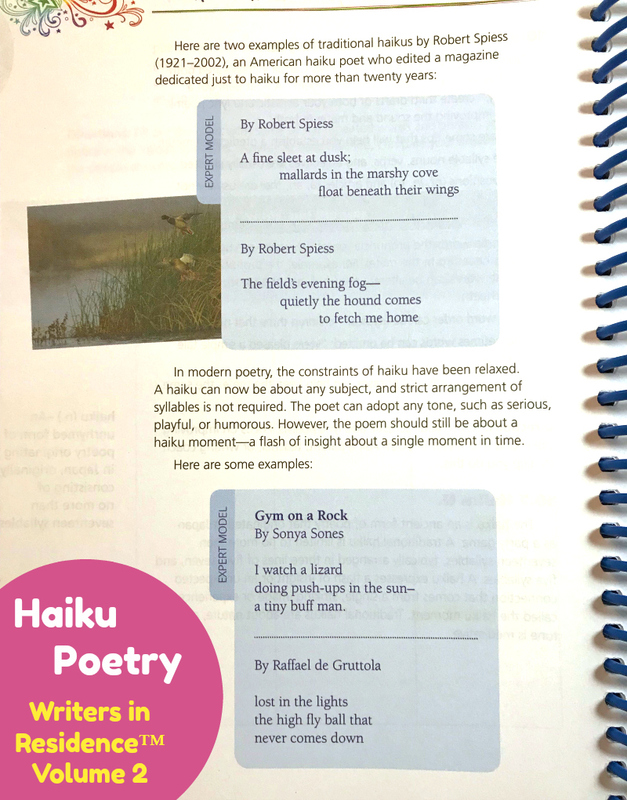 With each style of poem there is a separate rubric for the student to evaluate their own poetry. This allows them a simple checklist style method of going through and evaluating and improving on their own writing. They Also Have This Eclipse eBook FREEBIE!